An unusual and very tasty twist on chicken salad! I never measure ingredients when I create this salad – you can’t really go wrong, so play with it. Boil chicken (breasts and or legs according to your preference) for 20 minutes, let cool and cut into bite size pieces. I lightly salt the meat. Put whole cashews in a cast iron skillet, no oil, on low heat, and gently toast them til they are golden brown on the side. Cut your fruit of choice into bite-sized pieces. Stir together the dressing ingredients until well blended, and adjust amounts of everything according to your taste preference – if it’s not salty enough, add more tamari, if you want a stronger mayo flavor, add more mayo, etc. 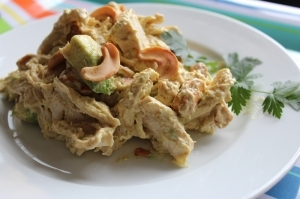 Place chicken in large bowl, pour dressing over it, and stir until evenly mixed. Then add fruit of your choice, and lightly toasted cashews, and mix it all together.